Photo: This will do nicely. If you’re wondering where to stay in Penang, here is our pick of the best places to consider. Read on for our comparison of the key areas to stay along with an overview of the best times to visit the island. At the time of writing, Agoda listed 1,481 places and Booking 963 places—and these are just the places registered with online travel agents. Obviously we didn’t inspect every one of the 1,481 spots on Agoda or 963 on Booking but we did look at over 100 in coming up with our final cut of 25, and take our word for it plenty did not make the cut! Broadly speaking the island has four styles of accommodation—cheap and dated guesthouses and hostels; more flashpacker styled modern hostels—in both cases sometimes in heritage buildings, then there is the more classic mid-range to quite flash restored heritage mansions. Lastly you’ll find more typical modern hotel-style and resorts. Especially at the budget end in Georgetown, the accommodation can be very variable—we’ve listed what we believe to be standout reliable options, so when you’re considering other options, especially if you are a bit of a cleanliness nut, read reviews! From 1 September 2017, foreign tourists staying in Malaysian hotels and guesthouses are subject to a ten ringgit per room per night tourism tax which is generally not quoted in the room rate, but will be added to your bill, although we spoke to one guesthouse who said they will be absorbing the tax and not passing it onto guests. Additionally all guests, both foreign and local, are charged a two ringgit per night heritage tax in Penang. The taxes are not subject to service charges added by hotels nor the six percent GST. If you’re watching your pennies, be aware that most hotels and guesthouses in Penang ups the rates on weekends and local holiday periods. Where is the best area to stay in Penang? Save some quirky off the map options, you’re most likely to find yourself considering either Georgetown or Batu Ferringhi as a base and we strongly recommend going with the former and would go as far as to say if your primary interest is a beach vacation, then you’re far better served for beaches on Langkawi than Penang, whose beaches, really are pretty lacklustre. Within Georgetown proper you can choose from either within the “heritage area” or a little further afield but still within walking distance of the heritage zone. There isn’t much to separate the two, though the heritage area does get more rammed with tourists and selfie sticks. If you’d prefer to dodge the hordes, look for spots a ten to 15 minute walk from the centre of things. When it comes to visiting Penang, there are plenty of reasons why the island should be included on a Southeast Asian sojourn, but determining when to come is perhaps a little more difficult. The weather, the tourist season and the local festivals can all have a big impact on how much you enjoy your experience of the island, so here is a guide to help you work out the best time of year for you to visit Penang. As a general rule, and as you would expect of the region, it is hot and humid almost all the time in Penang and the average year-round temperature is a fairly steady 28 degrees. However, things really heat up in February and early March. The extra few degrees, accompanied by the humidity, can make extended wandering around Georgetown a little hard-going unless you stick to early morning or late afternoon. At the same time, however, these months are normally blessed with cloudless blue skies, and this offers great photo opportunities. There is also very little rain at this time, so this may swing the balance for you. On the subject of rain, you also need to take account of the monsoon which, on the west coast of peninsular Malaysia, rears its rather damp and ugly head between May and early November. At either end of this period, May and October are the two wettest months, with 25 and 39 centimetres of rain respectively, and there is an increased chance of general dampness in the intervening months. This is not to say that it rains all day, every day between June and September, but the skies are definitely greyer. December and January are considered a good time to visit weather-wise, since it’s not too hot but there’s plenty of sun. However, be warned that like elsewhere in the world, the weather patterns in Malaysia over the last few years have been unpredictable, to say the least, so the above should only serve as a general guideline. One final thing to consider is that any time between April and June, Malaysia can suffer badly from haze caused by deforestation in Sumatra. Apart from ruining your chances of taking any form of landscape photography, the air can also be pretty nasty to breathe. It stands to reason that the months with the best weather attract the most tourists and December and January are very much high season in Penang. Christmas and New Year are always very busy, making things very lively in the hostels and bars over this period. At the opposite end of the scale, low season falls between May and October, so if you don’t mind risking rain you can get some much better deals at the hotels and hostels, although if you are keen on meeting fellow travellers this is not, perhaps, the best time to come to Penang. Penang’s diverse community means that just about every religious festival you can think of is celebrated here, and this can be a very good reason for making your visit coincide. Joining the crowds during colourful and chaotic Thaipusam celebrations, or experiencing dragon dances, Chinese opera and puppet shows over Lunar New Year, can really make your visit and give you a completely different insight into the varied culture of the island. Other festivals include Hungry Ghosts Festival and Nine Emperor Gods Festival. At the same time, some of these festival periods get extremely busy and attract lots of tourists, which makes accommodation less available and more expensive. The traffic on the island is also notoriously bad at any time of year, but especially on festival days, which may well interrupt your travel plans. Finally, at Lunar New Year, many shops and restaurants across the island close down entirely, as people go home to spend time with their families, which can leave parts of Georgetown feeling a bit dead. We reckon timing your visit in February or late November/early December makes a lot of sense, since you can take advantage of some of the island’s best weather, there are enough other travellers around to make Georgetown slightly more lively, and you can avoid peak season prices. If by any chance it rains, be assured that there is still plenty to do and if all else fails, you can always just spend a day eating your way through Penang’s famous cuisine. Penang’s best value hotels and guesthouses can be found at the mid to top end of the market with some delightful renovated heritage properties, so if you have funds for one or two splurge nights on your trip, Penang offers many excellent opportunities to indulge and make the most of your cash outlay. If you’re a savvy shopper, check out some of the online deals as several of the high end digs offer reduced rates competitive with lesser midrange choices. That’s not to say that folks with tighter pursestrings will not get good value, as some very good dorms and simple budget privates are up for grabs too, it may just require being a little more picky. Our top pick at the luxury end is the, well lovely, 23 Love Lane smack in the middle of the UNESCO heritage zone. This charming hotel ticks all the boxes for a comfortable boutique-style stay without feeling pretentious or over designed, yet with extras and service that goes that extra mile. If you’re looking for a romantic hideaway, you’ll be very satisfied here. The only downside is you’ll miss the rest of Georgetown as you’ll never want to leave your room. For around the same price tag, you can indulge your inner millionaire and sleep in the “Blue Mansion”, the former home of Penang’s “Rockefeller of the East” at Cheong Fatt Tze Mansion, now a museum. Grand antique-filled rooms occupy and annex to the museum, and an onsite swimming pool and fancy Peranakan style restaurant up the ante. 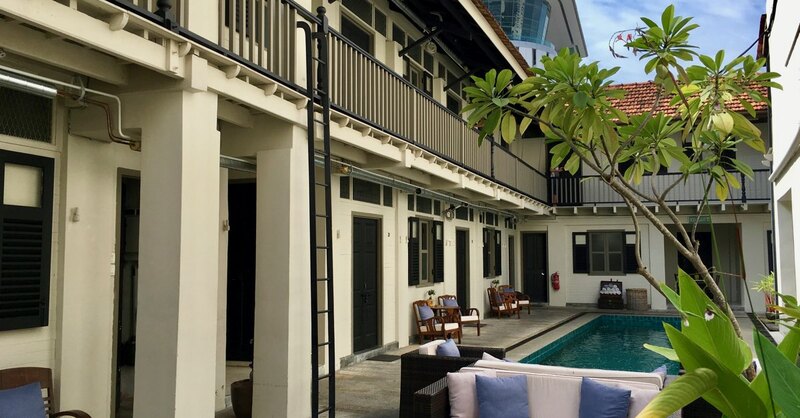 Ren i Tang in the heart of busy Little India graces a restored Chinese medicine warehouse, and the simple sleek design of the heritage renovation offers a restorative sleep that can only make you feel better. If you prefer your history mixed with a bit of contemporary style, hightail it to the stylish and arty Sinkeh. Single travellers are well catered for here with spacious minimalist style midrange rooms for around 100 ringgit less than similar doubles. And if you’re stuck for something to do in the evening, you may not even have to leave the hotel, with and onsite theatre showcasing the local contemporary performing arts. Lang Hoose offers the cosy mixed with the quirky with a range of rooms across budgets from flashpacker to midrange catering from singles to families and housing an eccentric whimsical compendium of miscellany in it’s museum-like common areas. The bonus here is that the majority of rooms enjoy private ensuite bathrooms, rarer in heritage guesthouses at this price point. Moving into the next lower budget category, Ropewalk Guesthouse also offers a mix of sleeping options from one of the best dorms in town with curtained single beds—no bunks (sorry guys, female only) to simple and clean private rooms with share or ensuite bathrooms. Backpackers will not miss out on style either at The Frame Guesthouse with its minimal industrial aesthetic. Comfortable dorms and privates are smart and clean and common areas from cosy TV rooms to a large open-style kitchen and a small outdoor terrace get our thumbs up.